A beautiful spring day with light southerly winds ran on into a soft evening at FSC. Seventeen yachts came out to the start line off Trefusis where Bob Chapple had positioned the committee boat, Noon Hi, kindly provided by Jack Penty. The Race Officer had to use Race Officer's choice for the courses as many of the laid racing marks had been swept from their positions by the vicious weekend storms. The ten yachts in Q class and 6 in U class were given Black Rock to Port, North Bank to Port and finish. The strong spring tide and easing wind made for a tactical beat up the western shore to Black Rock and a tactical, find the wind and maximum tide, back to North Bank. Q class were first off and apart from Afrita, Andrew Laming and Temeraire, Martin Eddy who had good beat starts the rest were far too high trying to barge and funnel in by the committee boat. Come on guys you are supposed to be “top guns”! U class then went off in an orderly fashion. Aurora, Mandy Owen in pole position with Trifle, Chris Jelliss just to leeward on the line on the time. The Sonata, Trifle had good boat speed and took an early lead up the beat followed by Popincoota, Alan Grose. U class soon caught up with Q class back markers and in Trifle we were suffering in a lot of disturbed wind from ahead. First round the windward mark was Excelle, John Fox followed closely by Temeraire, Martin Eddy. Trifle, Chris Jelliss made a tack for the Black Rock buoy as the wind seemed better nearer the buoy and the back of Q fleet seemed to be lifted towards it. 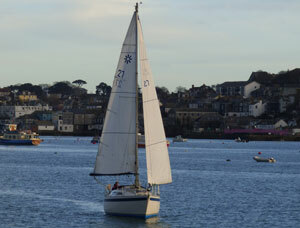 The ever increasing tide took its toll and Kaimana, Nigel Rowe went earlier and stayed with the wind. Trifle found a hole in the wind and Popincoota was first around followed by Kaimana. Spinnakers set it was now a tidal dash with virtually nil apparent wind to North Bank. Popincoota went east. Kaimana stayed central and Trifle went west on a port gybe. Gybes swapped and Trifle made up on Kaimana eventually overtaking near the castle. The committee boat positioned itself at the North Bank and shorted course. Line honours were taken by John Hicks in his new half tonner, Rampage, a Phillipe Briand designed French one-off. She had been launched that evening and had her first shake down sail. He was beaten on handicap by Excelle John Fox and Temeraire, Martin Eddy. Popincoota took line honours in U class but was beaten on handicap by Trifle, Chris Jelliss. In W class Sweet Friday, Len Cheshire had another sail over which is disappointing as Len enjoys good competition. Come on you guys and girls out there who want to enjoy racing but don't want to fly a spinnaker. General Khaos, Ian Jakeways retired from Q class and Levity, Guy English and Ida, Mike Swingler retired from U class. 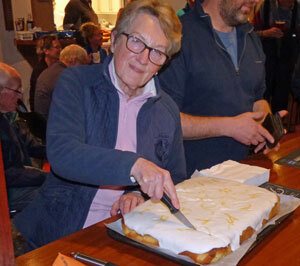 The Sailing Club was buzzing with crews eagerly tucking into sailing suppers and beer. We all sang Happy Birthday to Inez on her birthday and the Commodore presented her with a card signed by members and a bouquet of flowers. We all tucked into birthday cake baked by Sarah of Annie's Kitchen. A great evening with a stunning sunset in high altocumulus to the west.